Hi guys! I'm back! Thanks for your patience and kind words. My life has now settled down and I am ready to resume reading comics and writing about them. I haven't picked up my comics in two weeks. Insane, eh? I also haven't worked at the store in weeks. But that all changes now! 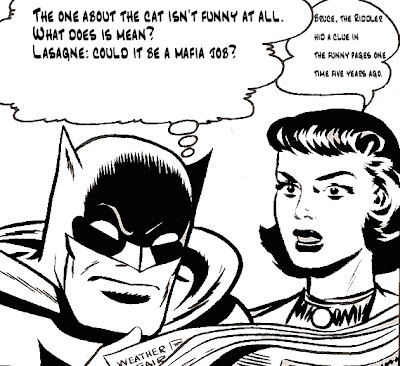 I think Bruce's thoughts match his facial expression perfectly. Ditto with Lois. 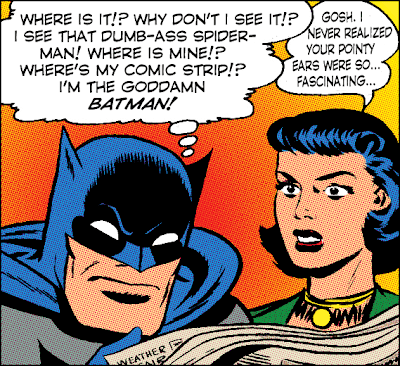 Plus, the idea that Batman is analyzing the Sunday comics every week for Riddler clues? Hilarious. So congrats, Scott! Email me with your address and you get an autographed copy of Nexus: The Origin, signed by the legendary Steve Rude (courtesy of Strange Adventures)! And, hey, Tony Z...I'll send you something too. Thanks to everyone who entered. You can see all the entries here.